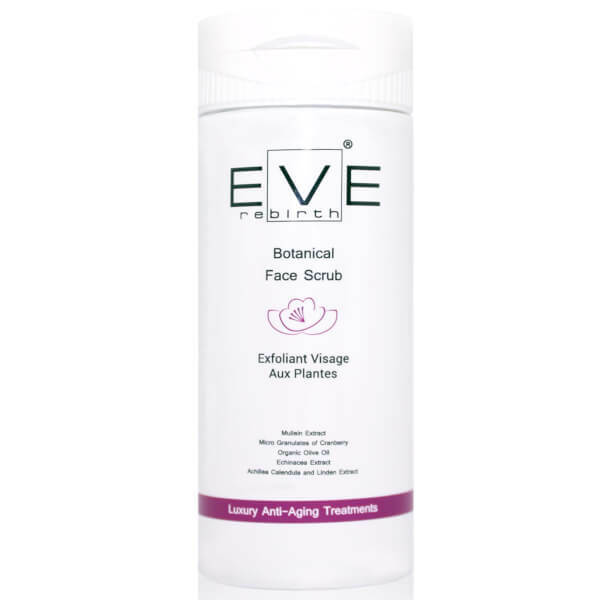 Thoroughly exfoliate your skin with the Eve Rebirth Botanical Face Scrub; a gentle yet effective formula that works to reveal a polished and healthy looking complexion. 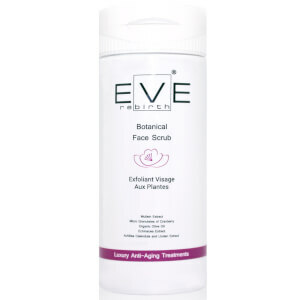 Gently sloughing away dead skin cells, micro granules of Cranberry contained within the scrub offer deep and superior exfoliation for the entire complexion. The rich formula is fortified with a skin-loving blend of organic Olive Oil, Achillea and Linden, which works to deliver intense nourishment to skin, whilst promoting improvements in skin’s elasticity to leave it visibly firm and supple. The Botanical Face Scrub is complete with a dose of organic Mullein extract, which works to shield and protect the face from UV rays and oxidant stress. Apply every 3 days alternating the cleanser. Massaging with circular movements on humid skin and rinse abundantly. Aqua (Water), Malva Sylvestris Leaf Water, Caprylic/Capric Triglyceride, Vaccinium Macrocarpon (Cranberry) Seed Powder*, Olea Europaea (Olive) Fruit Oil*, Cetearyl Alcohol, Cetyl Alcohol, Glycerin, Sorbitan Olivate, Cetearyl Olivate, Tilia Tomentosa Extract*, Tocopherol, Achillea Millefolium Extract*, Echinacea Pallida Extract*, Calendula Officinalis Flower Extract*, Hydrolyzed Verbascum Thapsus Flower*, Lauryl Olivate, Helianthus Annuus (Sunflower) Seed Oil*, Cetyl Palmitate, Sorbitan Palmitate, Xanthan Gum, Citric Acid, Glyceryl Caprylate, Sodium Levulinate, Sodium Anisate, Sodium Phytate, Glyceryl Undecylenate, Parfum (Fragrance).